Ever since its debut in 2013, Rooster Teeth’s fantasy-action series RWBY has amassed a devoted mass following of fans who thrill to the series’ high-energy fight scenes. Now, the people making RWBY will be branching out into giant mech scifi, aiming to tell cool stories in a whole new genre. Last Saturday at RTX, I spoke with Gen:Lock writer/director Gray G. Haddock—who’s also the studio’s head of animation—to find out where the six-year Rooster Teeth veteran and his team are drawing inspiration from. io9: So, you’ve been working on RWBY up until this point, which is rooted in magical fantasy, and Gen:Lock is a mecha show. Can you talk about the differences between the genres and where the ideas for Gen:Lock came from? Gray G. Haddock: We’re entering volume five of RWBY right now, which is our action-based magical-girl monster-hunter show. We wanted to do something that was slightly more mature in storytelling and could appeal to the RWBY fans as they continue to grow up, and start branching out into more kinds of animated shows. We want to say hello to all the fans of big-idea science fiction storytelling, and our own Red vs. Blue audience that, you know, might have checked out RWBY, but, maybe it wasn’t quite for them. So we want to make sure that they got something new to enjoy as well. io9: You mentioned big-idea science fiction; what kind of things are in that wheelhouse for you? Haddock: I’m not ready to go into too much detail about the main gimmick of the show, but me and the team working on it, we’re all just huge fans of anime, of Ghost in the Shell, and any of the Gundam anime we love. Aldnoah Zero. Gargantua. I’m a huge fan of the writing of Gen Urobuchi, who did a whole bunch of science fiction anime in Japan. I would say all of my stuff is heavily influenced by his stuff, or at least we share very similar tastes. We’re started with some ingredients that everybody here is craving to see in a new series. Whether it’s stuff from a mech show, or cyberpunk like Ghost in the Shell or Psycho-Pass, or really strong, character-driven emotional storytelling like Kiznaiver. I thought that Trigger’s brilliance with Kiznaiver was that they got rid of all the trappings of what’s going on with the world and just focused on this one scientific experiment with the kids. We’re going to take a lot of that stuff, put it in a blender, add a whole bunch of new ingredients, and see what happens. io9: Mecha is the kind of genre that people tend to associate so strongly with Japanese sensibilities and culture. How do you strike a balance, in terms of paying homage versus trying to ground it in sensibilities that are your own? Haddock: I’d definitely say it requires a balance. We want to acknowledge the roots and make a show that was a combination of all these other shows that we love. The mantra at Rooster Teeth is, “If there’s something that you find cool, go make that and see if you can find some other audience and friends out there in the community who will be like-minded and check out your stuff and follow you on that show as well.” We don’t want to just blindly repeat. It’s not the case that our animation studio just wants to keep cycling through all the different genres of anime. We’re not going to go all “slice-of-life, yandere…”, you know. io9: There’s no ice-skating anime series coming from you guys? No Yuri On Ice? Haddock: [laughs] Never say never. Everybody inside Rooster Teeth Animation has such broad tastes. I suspect we’ll get around to doing different kinds of things eventually. But, right now, we want to watch more, cool, scifi mech shows and there’s really nothing like that happening in the West. When you talk about that subject, you think of Japan as being out on the front lines and we’re definitely paying homage to, as well as mixing up, what they’ve been up to. The thing about RWBY is, I love how you can’t really define what kind of show it is. Is it an anime, or not? That’s a really fun debate. We’re not that invested in the debate at our company and I have to confess we’re enjoying that confusion. I like the fact that nobody can pin us down. “Are we an anime? Are we a CG show? Are we inspired by anime? Are we kind of doing our own thing that’s blending East and West?” We don’t have a label for it yet. I’m thrilled we don’t have a label for it yet. And if Gen:Lock can follow that same path of just making up its own sub-genre, then I will be thrilled. io9: How do you want to make it distinctive from RWBY in terms of visuals? Haddock: It’s still in development, but we do want to go for a slightly more detailed look. The character designs will have a little more detail to them, be slightly more real-world… RWBY’s look is very clean, very abstract, very simple lines. And the kind of storytelling that we want to do in Gen:Lock is going to require a slightly more detailed approach to it. We actually reached out to a member of the RWBY fan art community named Bach Do, who goes by dishwasher1910 online. He’s done crazy remixes putting RWBY girls in different shows and predicted scenes from upcoming episodes with scary accuracy, like the death of a supporting character in Volume Three. He even got the identity of the killer and the camera angle of the shot right. I was wondering how our plots were leaking! But it’s his recent RWBY mashup work that completely pushed me over the edge and convinced me he was a good candidate to contribute to Gen:Lock. His style is evolving at an amazingly accelerated rate compared to where he was just a few years ago. His sense of light and the moody atmospheres starting to come through his work are very much what I’d like to see in a couple of the levels of reality that Gen:Lock will operate on. I reached out to him as part of the Rooster Teeth tradition of getting the community involved. We were in the process of submitting for greenlight approval while also doing other stuff so we reached out and asked for him to help with and character designs and mood paintings. It’s Bach’s teaser image that we used to announce the show. He’s an art student but we made him an official remote contract employee of Rooster Teeth just for this. io9: What kind of critique are you anticipating about Gen:Lock? Haddock: The thing about doing a mecha show is that there’s a portion of the audience that pays very, very close attention to the details of the technology and the consistency of the rules that you’re building up inside the world. And our technology on the show does work in a very specific way. Some of the action and drama will come from getting around some of those rules and challenges. There are people I know who are going to pick apart our designs and have all sorts of colorful things to say about it. But, [the challenge is] balancing how crazy you want to get with the detail—making sure every single bolt and wire makes sense and knowing exactly how the mecha work in the show—with the need to just make the show and finish the production. We need to let go of the design phase at a certain point; otherwise, it’s not going to come out at a time when we can all enjoy things. So, hopefully we can go ahead and establish some logic and consistency and hint at some things under the hood. Then, over the run of the series, we should have more time to develop things, and fans will be rewarded with more and more glimpses at exactly how everything works. io9: Back to the other show you’ve been working on, what do you think are the biggest misconceptions people had about RWBY that you have since debunked? Haddock: I don’t know. The thing about RWBY, we were surprised by the audience that found us. You can’t plan for the following that we’ve generated. We’ve just kind of been hanging onto that ride for dear life ever since. And I think there’s a lot of valid observations about the state of our approach to it when we first started and how that’s evolved year after year. I’m so proud of we’ve raised the bar every year at Rooster Teeth Animation. We would get bored if we were doing the exact same look and feel with the exact same process for every show. Some people, it’s a little difficult for them to wrap their head around it, but for us, we’ve got to evolve the look and feel of the show every year. We keep improving the technology that’s been happening behind the scenes. The guys keep improving their writing. I would say that what some people see as rough edges with the early volumes, I still think they’re the kind of love letters to the state our team was in at the time and what we knew how to do. We were just making it up as we went. And I’m convinced that Gen:Lock is going to have a similar trajectory. We’re going to work our hardest to make something really, really, really cool that I hope the fans enjoy. io9: The learning curve will be on the screen. Haddock: Absolutely, it’ll be there. If we’re so luck as to have additional seasons down the road, I can’t even imagine what we’ll be up to a couple of years from now. And I’m sure we’ll look back and cringe when we look at season one of Gen:Lock and wish we’d go back and re-master it, but, they’re little time capsules. io9: Speaking of time, you guys have your own animation house, your own distribution platform. So, nobody has to tell you when to quit. 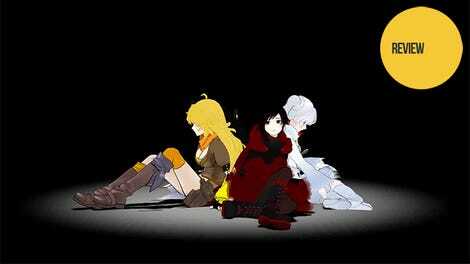 At what point, do you feel RWBY will run its course? But even so, [RWBY creators] Monty Oum, Miles [Luna], and Kerry [Shawcross] built such a lush world that was so full of these amazing characters and detail and they kept hinting at all the different corners of the globe that you could possibly visit. Right now, we’re only getting a taste of that culture and environment. Just because the main story of Team RWBY has a beginning a middle and end to it, doesn’t mean that we’re done telling stories in the world around them. Hopefully it will keep going. For all our shows, as long as the fans keep watching it, we’ll want to keep making it.